Today is Valentine's Day and would like to take the chance to write about an appreciation of a different kind of love, a love for the local communities, more precisely, boutiques that have created them, which support local talents. My relocation back home to Vancouver has not always been the smoothest, and without these wonderful stores and their owners and staff, it would be even more bumpy. Though am writing about only 3 here today, am very grateful of others too: Branches & Knots (W Broadway), Stock Home Design (W Broadway), Giving Gifts (Main Street), Banyen Books & Sounds (4th Ave), espace d. (Gastown), and Little Gypsy's Fine Jewelry Gifts & Gallery (Port Moody). First up is Half Fool Cafe in Chinatown (18 East Pender Street, Vancouver). It’s a wonderful place with a great selection of drinks: coffee (they use locally roasted Modus Coffee beans), freshly made smoothies, and teas, caffeinated and not, alongside a sweet collection of edible and inedible goodies made by talented locals—baked goods, teas, chocolates, body & bath items, mason jar products, decorative plants and more. Of course, cards, prints, and artwork too! I have always placed a lot of emphasis on en (Japanese for fate, chance, connection, destiny), I mean even titled one of my exhibitions, with the word. One day last month I decided to pop in and check out the cafe, as it has been over a year since I last stepped into the place. Was pleasantly surprised by the new look arrangements, and a new owner. We had a great chat, which turned into more later on. Am very blessed to have connected with him—he is as lovely if not more than the wonderful space he has created. More than just wanting to turn a profit, he really is determined to build a community of local talents and be a part of the community that his cafe is in by taking part in cultural celebrations such as Chinese New Year and by hosting an array of special events to shine a spotlight on hometown talents. Next up is the must stop by place in Port Moody, Willow & Wallflower in Port Moody (2606 St. Johns Street, Port Moody). The charming store is always changing with new and beautiful finds—the owner has a great eye for the perfect one-of-a-kind vintage pieces, locally made arts and crafts and much much more! Though I don't have a baby, their baby section is marvelous. I hardly leave the place empty handed or without inspirations. Like Half Fool, Willow & Wallflower is about hometown love and pride, so much so, that it has been the winner of Port Moody Golden Spike Award for Arts in Business 3 years in a row, from 2016 to 2018! The awards are handed out by the City of Port Moody to "recognize Port Moody businesses that impressed residents in a variety of ways, from their street appeal and great customer service to their business spirit and environmental leadership". Lastly, is White Lotus Divine Healing (2607 St. Johns Street, Port Moody), right across the street from Willow & Wallflower. Every single time I open the door and step into the boutique, I feel a sense of peace and positive energy. The scent of the place is so calming and ever so subtle, which I tried to recreate myself and sadly did not work. The store is not home to just healing items, such as crystals, books, art, jewellery, herbs, and more, but it also hosts meditations, wellness sessions/workshops for the body, mind & soul, and even retreats. It's not just for "spiritual hippies", White Lotus is for anyone who likes or is looking for a little zen and goodness, which am all about. Get your dose of positivity recharged here! Please do check the above places and thank you to them and to you for being so supportive of local talents and businesses! Because without them and without you, people like myself would be at a complete lost. As 2018 is drawing to a close, I have been reflecting on this year. I will be honest with you, it hasn’t been an easy one, there were some major learning curves for me—new website, Etsy, my own online store, a show featuring 12 new paintings, but most of all, health and family-related issues. Actually, am still under the weather, and have been for this holiday season. I needed to learn to connect better with myself and am grateful that I have my art and writing as an outlet, not just a creative one, but a spiritual one, which has given me a purpose, kept me grounded and going. I mentioned many times before, the aim of my work—illustrations, paintings, books, even commissioned pieces is to share with others joy, light, zen, and positive cheers. For example, there are many people who believes that if they were to have a painting up on their walls, it should be bright, big, bold, even shocking, and draws your attention in immediately. However, with my “bubbles” painting(s), it is soft, delicate, calming, and draws your attention in slowly—the more longer you look, or the more times you see it, you’ll discover something new, or at least that is what I try to achieve! Hahaha……I want it to be the piece that you can unwind in front of after a long day, or at the beginning of your day, and from time to time get lost daydreaming in it. As for my blotted line drawings, they are almost always whimsical and lighthearted, with lots of white space for you to imagine the background and hence the story the illustration or you is/are telling. I aim to create a world that I invite you to join and then make it your own. When it comes to writing, I just want to bring a smile to whoever is reading my piece, and if they can take something away from it that will brighten their day(s) or improve their well-being, all the merrier! That was why I wrote How To Take a Wa Style Bath. It took more than 2 years for the project to be finalized and published, but I really wanted to share and spread the word on the amazing health benefits (relaxation, detox, increasing metabolism, and more)of taking Japanese style baths. Of course, the same can be said about my greeting cards, prints, and commissioned pieces. So, I have decided for the 2019 to focus on nourishing art, how art nourishes the soul and how it connects with wellness, be it self-love, self-care, wholeness or balance. Would you please come on this journey with me? I may not the the perfect companion, as I too am learning all the time, but it’s nice to have some company, no? I have been working on these decorative art prints for a while now, since it has taken me quite some time to get it just right and out to local stores, and as of this post, I still haven't listed them on my own website nor Etsy yet. I have been thinking of having decorative art prints for a long time, but to get the quality of printing, the right paper/card stock, a nice description card to go with them, and then sourcing the right matting and packaging materials—all within reasonable pricing, have been a little challenging. Because these are not "fine art" prints, but "decorative art" prints, the price point is much much lower. At the same time, I didn't want the quality of my work to suffer. After several test proofs on different paper and many discussions with my printer, am happy to say that they turned out beautifully and I hope you would agree with me on this one. The result, my "the stars" series are now not only available as greeting cards, but decorative art prints as sized 8" x 10" (11" x 14" for the matted versions) and locally printed in small batches/runs, on premium linen paper card stock with vegetable ink, while my "bubbles series" along with my "lotus" are printed on premium vellum finished stock. Yes, I used different paper for different prints, to achieve the best look and feel for the finished piece. That said, the purpose of the prints remain the same, as with my books, paintings, and other work—to spread some joy, positive vibes, and zen to others. That has been my goal when I create my creative projects. 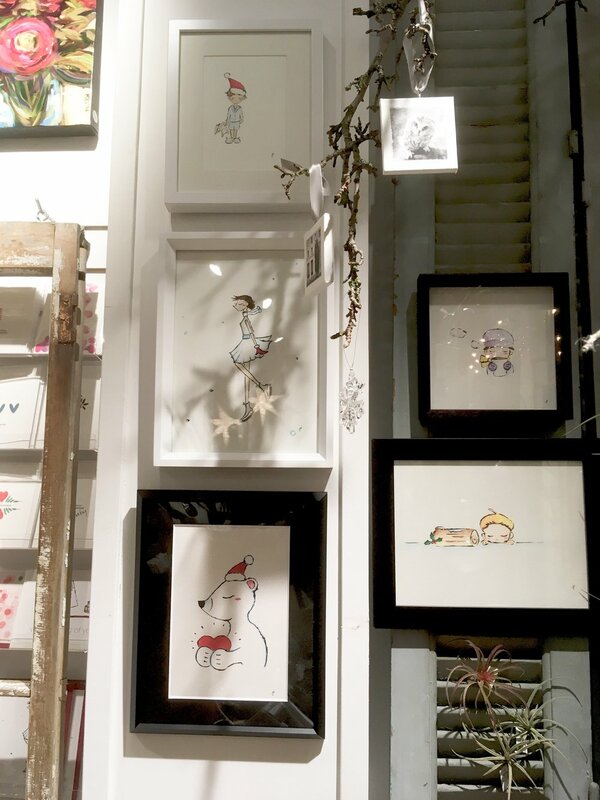 With the holiday season coming up, am very happy that my original holiday illustrations are on display and available for sale at Stock Home Design (3060 West Broadway) in Vancouver. Please come see a skating Lala, nikoko the polar bear, an adorable & hungry boy eyeing a bûche de Noël and more in person. And do check out the beautiful store—my holiday greetings and new decorative prints are here too! Please note: the last photo is of the store’s interior, the artworks shown are not by me. 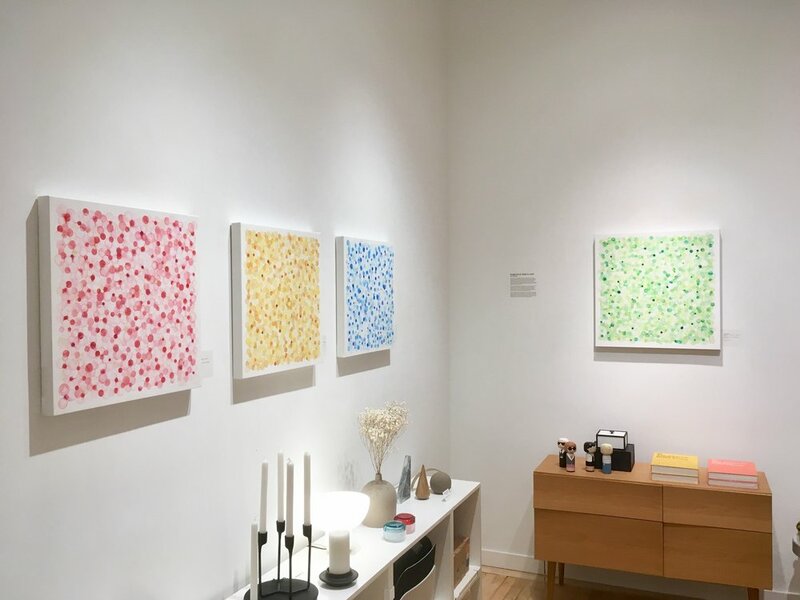 Here are the photos taken just before the opening reception—all 12 paintings, each inspired by a birthstone from each month. The ones I decided to paint were, listed here in order of the month (Jan - Dec): Garnet, Amethyst, Aquamarine, Diamond, Moonstone, Ruby, Peridot, Sapphire, Pink Tourmaline, Topaz, and Turquoise. It was a dream come true to finally see all 12 pieces on walls and be displayed properly in a beautiful space, and then have others enjoy them. I cannot thank everyone enough who has made this show possible and the opening reception such a wonderful experience. These people are not just the wonderful owner of espace d. and my supporters who came to the event; but from the friendly staff of the art stores I visit often with my questions and requests, to the dear friend who took all the photos of my art, from the team at the printer I turn to for all the small and detailed orders I place, to friends from all over the world wishing me the very best. The owners of other local boutiques too have been extremely helpful with their advice and suggestions. Thank you thank you thank you. I must also thank the local farmers here who lovingly grow the nutritious produce that power me (can’t live without the Farmer’s Markets here), and then the various cafes that fuel me with great caffeine and excellent food when am sleepy, on the run, or just too lazy to make my own meals. And lastly, thank you to you, who are reading about this post now. It hasn’t been the easiest relocating from Tokyo back to Vancouver, but you all have made it this amazing and am forever grateful! Please join us for the opening reception of my art exhibition featuring all new the "bubbles" series paintings. I have been working on these watercolour on canvas pieces for the past 6 months. They were inspired by the wondrous beauty of gemstones, warm rays of sunlight, and vibrant colours of the light spectrum. Shown here are the artwork for the exhibition, the first is the printed postcard, and the second is the digital invitation. 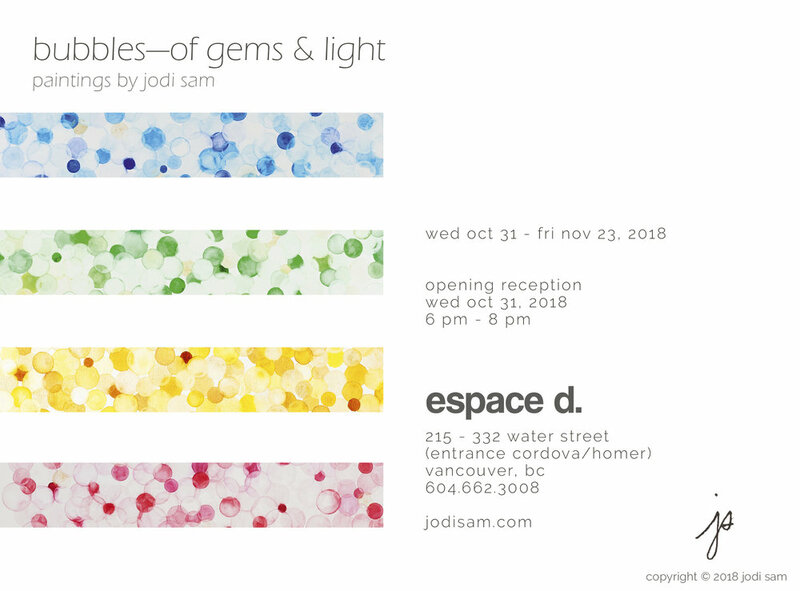 I used 4 different bubbles paintings as "bars" that are similar to the colours/wavelengths of the light spectrum, since the show was inspired by gemstones and light. 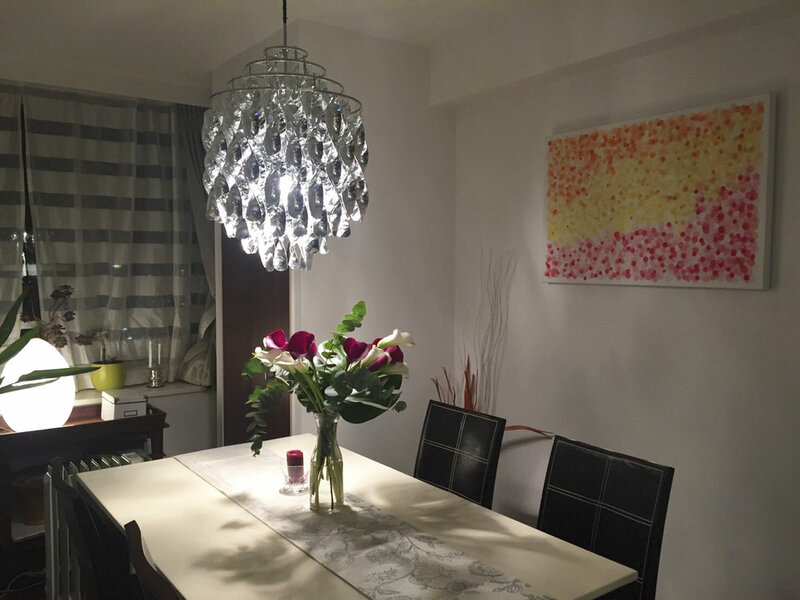 This is the first time I am sharing my large sized "bubbles" paintings in North America. Additional pieces will be shown during the opening reception, so don't miss out on the special opportunity—I look forward to seeing everyone then! A true story about espace d. besides it being of my favourite art/interior/houseware boutique in Vancouver: when I first came back the city 2 years ago, I walked past espace d. on a dark and chilly autumn evening. The lights from the store’s big front windows was glowing, the many faces inside were lit with joy, and I can tell from afar that there was an opening party for an art exhibition. I thought to myself then, wouldn’t it be nice if I were to hold a show there someday? Two years later, I am!! What a wonderful opportunity/gift I’ve received from the owner of the boutique and the universe! Am forever grateful. Am soooo excited to share this with you! Yes, jodisam.com online store is finally up, running, and open for business! You can shop directly, conveniently, and internationally from here. Of course, the section is much wider than my Etsy store (www.etsy.com/ca/shop/jodisamstudio), with more than 60+ cards—I have added the new "breathe", "the stars" series and even the holiday ones! Actually, I have been working on this even before starting on my Etsy store, which launched earlier, 2 months ago. Given there was much more to do, and even more that was and still is completely new to me, it took me quite some time to put it all together. Available Now: Greeting Cards. Coming Soon: Commissioned Pieces, Prints, and Original Artwork. Just in time for the Canadian Thanksgiving long weekend, and I for one am very thankful of all the love and support everyone has shown me over the years. As a small thank you, receive 10% off discount with the code: THANKFUL10 (from now until Oct 31 2018) and FREE SHIPPING too for orders over $50 (Canada) and $75 (US & Worldwide). Oh, the Any 5 Cards for $25 CAD is a great deal too! Am aiming to spread lots and lots of positive bubbly happiness worldwide! Have been working on some projects lately, and they have taken up a lot of my time, which is another excuse for not posting as much as I would like to. But finally, I can share with you one of my undertakings. It's my Etsy store named jodisamstudio. I have been asked many times by people where they can purchase my cards and artwork besides select Vancouver boutiques or at my shows. So, here's my answer to them. Actually I wanted to set up a store on Etsy for quite sometime, as I have been buying many wonderful pieces, especially handmade jewellery, from the site for years. As simple as it seems, it is no easy feat. Just taking photos of my cards in itself was a huge task to tackle, and am still in the process of it. Of course, there is the payment account registration, writing the descriptions, setting up prices--the means to figure out exchange rates, shipping and etc., and ordering some shipping supplies--because I want my packages to arrive pretty inside and out. That said, here is the beginning of another chapter of my eCommerce adventure, the first one being my eBooks and print-on-demand books on Amazon/Blurb, LINE Stickers, and my lovely collaboration with Umade. It's a learning curve every time, but always a great experience. I am only partially done updating available items, so keep on checking back the store. And yes, there will be many more cards available on my Etsy store than carried at local boutiques. Am also dreaming up new items, other than cards and original artworks, too! So, would you please kindly join me on this digital journey of mine? Of course, do let me know what you think, since all feedback are welcomed and much appreciated! Oh, must mention that there is a special Buy 5 Get 1 Free offer available right now! Many people often ask me if I do indeed paint each and every single bubble in my paintings by hand, and when I answer yes, they would say "you must be very patient!". In all honesty, am not, which is very ironic/contradictory, as I like to create my pieces, no matter if it's the blotted line drawing illustrations or my bubbles painting, using time consuming and tedious techniques. In the case of painting numerous on bubbles am using softer watercolour brushes on a rougher canvas surface. 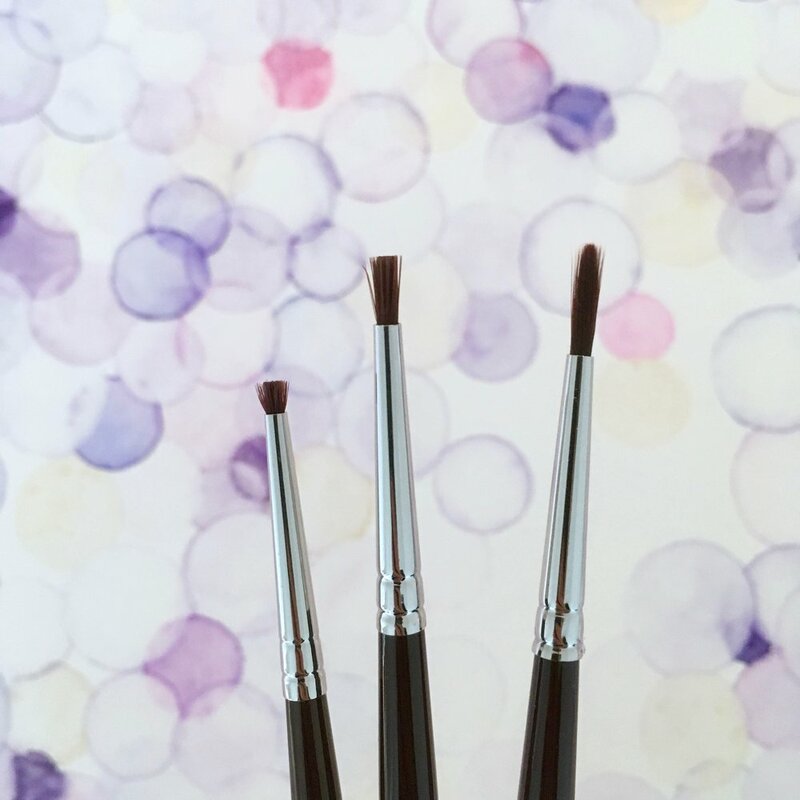 I used to use natural fiber Japanese brushes, efude, but I went through too many of them in a very short period of time. What's worse, is that they are impossible to replace here in Canada. I take care of my supplies very well, as they are an important part of my work. However, I just put my brushes through way too much to a point that it's heartbreaking and I do feel sorry for them. If you are wondering what brushes I use, it's Winsor & Newton Galeria Round. That said, I still use fude whenever am painting on paper, which is better, but they too will need to replaced much quicker than they were meant to be. I want to share today a commissioned piece that I painted for a yomogi steam salon in Japan. The beauty treatment originates in Korea, but it's gaining popularity in Japan and other parts of Asia. It involves the steaming of yomogi under a chair which the person receiving the treatment sits on while wearing an oversized cape to trap all the goodness of the steam in. A detox and beauty within treatment that has been gathering many fans. Yomogi, is Japanese mugwort, a herb that can be eaten (especially when made into a delicious rice cake dessert--Google yomogi mochi, or kusamochi and you would know what I mean), drank, or used for steaming. It is known for its detoxing, healing, warming properties, and for ladies, to help alleviate the bloating, menstrual craps and more. Hence, when pregnant or nursing the herb should be avoided. Self-care has always been the core of my work, may it be writing and illustrating books like How To Take a Wa Style Bath and My Little Book of Happiness, which are about taking care of oneself, or painting my bubbles series, as it brings a sense of zen to both the painter (me) and the viewer (you). 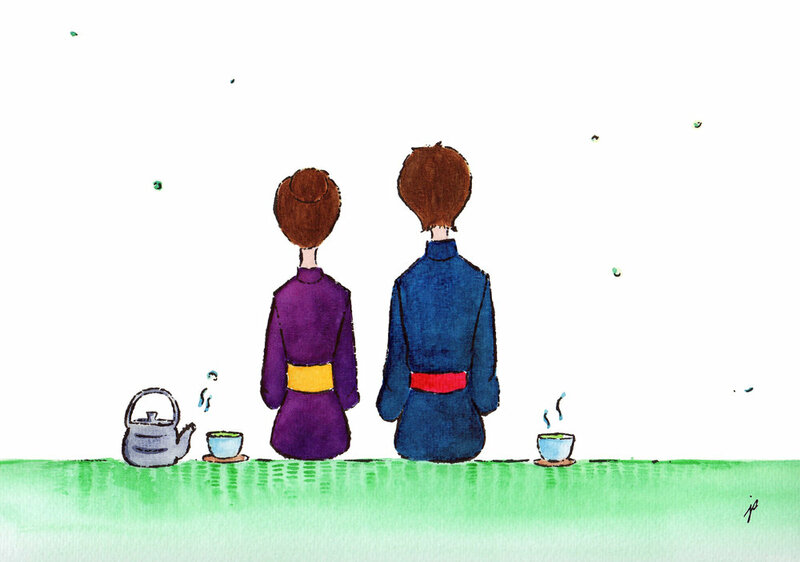 So, I was extremely delighted when I was asked to illustrate this piece for a new yomogi salon. It really shows how lucky I am to have these wonderful opportunities! Am so excited that I can finally share with you my newest collaboration with Umade, an amazing and innovative company that specializes in unique interior decor goods. They are a strong supporter of creative talents and allow shoppers to personalize items to suit their own needs. 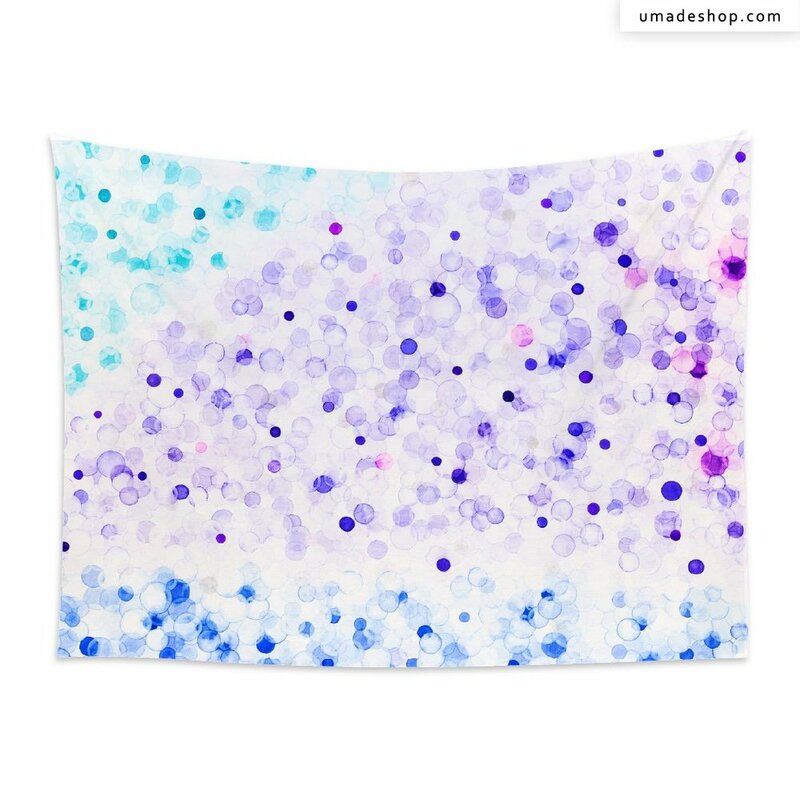 My bubbles are now made into beautiful wall tapestry that comes in a variety of sizes from 75 x 100 cm (29.5" x 39.5") to 112 x 150 cm (44" x 59")! I know that original paintings are not always accessible, but these wall tapestry definitely are. I have selected some of my favourite nature inspired pieces for this collaboration, and hope these little bubbles will bring lots of joy and positive energy to you all! Here are some images for you to see. For more details and to purchase, please click on any of the images in this post. It's been almost 5 years since my website received a major overhaul. The last time was back in 2013, and it took me 2 months to perfect the look and feel of it. I have been thinking about redoing my site for more than a year now, and I finally did! Am very happy to share this with you--though, you reading this post right now, would have already seen it! I did not just refreshed it with a new template, but I decided to redo everything (yes, I redesigned some elements and then copied and pasted all the content over) to give a smoother navigation experience, and a lighter look. Come to think of it, my first website in 2005 was completely based on black, then in 2013 it was dark grey, and come 2018, it's now white with light grey. The new site took me a solid month, but there is still much more to do--keep watching this space, as I have more things planned for this little website of mine! And thank you for being with me on this creative life journey. I posted a couple of photos in my previous post of the new homes of my work, something I don't even get to see often myself. Am fortunate to have another one to share with you. 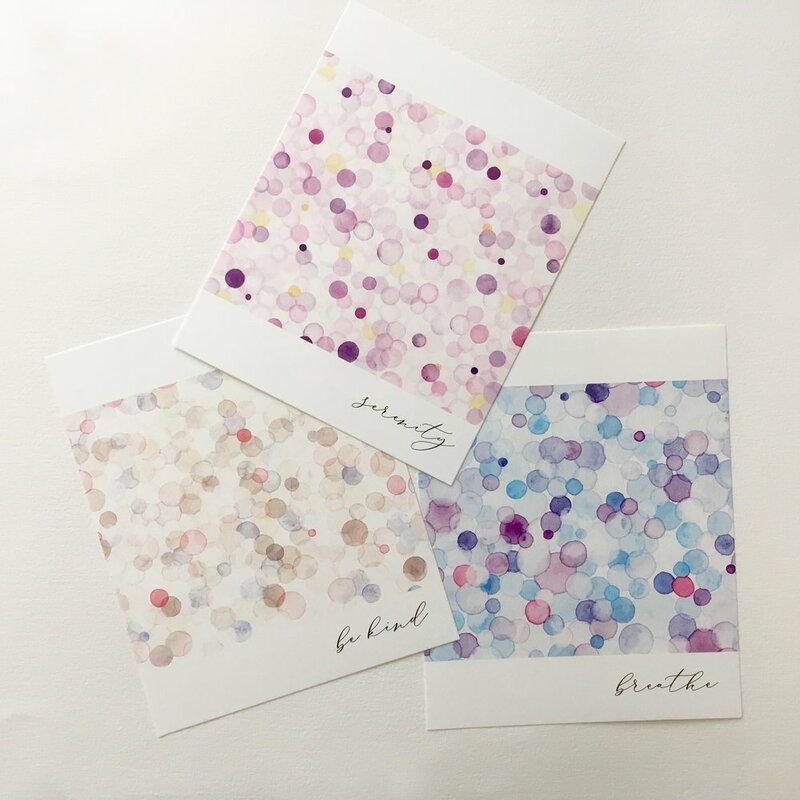 The painting, bubbles–wisteria, has not only a new home but a friend, a beautiful photo both hanging on the wall of an advertising firm's office in Tokyo. Funny, as both pieces are of flowers and nature. I cannot thank everyone enough--am forever grateful. Am grateful every day that I can do what I do, because it brings me and hopefully, many others true joy. My paintings are like my babies and sadly, I don't often get photos of the new homes of my work once I see them off to their new owners. But, when I do get photos, am even more grateful and humbled. I hand delivered this painting, bubbles--autumn II, soon after I wrapped up my in Tokyo, where it now is, hanging in the beautiful living-dining room of its new owners. Am so happy that it is a part of their daily lives, and that through it, I am too. I hope that my work will give them lots of positive bubbly energy filled with joy, love and flow! And of course, thank you to the new owners for giving my work a new home, and for sending me the photos--am so blessed! Am a little late in announcing, but am extremely excited to be a part of Roam Gallery's artists! What started to be a west coast based art gallery, but now moving on to the east coast and focusing even more on its online presence, Roam Gallery brings together many local/Canadian talents. Thank you Roam Gallery--am in wonderful creative company!